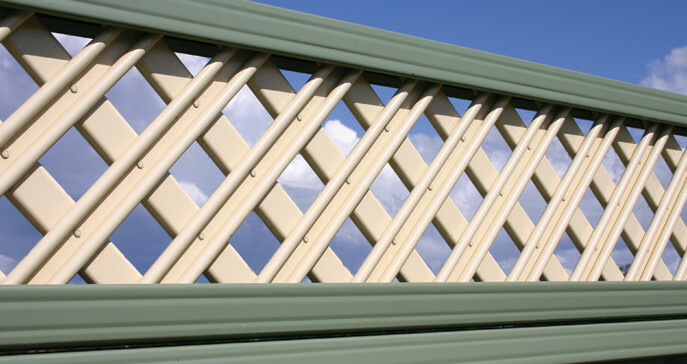 The unique and attractive GramLat® 3D Lattice™ is the ONLY genuine double-sided, 3 Dimensional Prepainted Steel Lattice that was introduced into the market in 1999. GramLat® 3D Lattice™ slats are rollformed into an exclusive profile that is an Australian registered product of GramLine® (Registration No. 141018S). The GramLine® brand is embossed on the lattice for peace of mind and traceability. The GramLat® 3D Lattice™ is the perfect decorative addition option available as a complete system with your new fence or as an extension that can be added to your existing fence. It is a stylish and durable way to add privacy and security while also allowing the light and breeze to filter through. Stylish & durable way to add privacy & security. Matches the appearance of traditional lattice but has the advantage of being pre-painted, low maintenance and termite resistant. Available in all the GramLine® Steel Fencing colour range. Unique designs gives you the opportunity to purchase single or dual colour slats to complement the style and colour scheme of any home. Comes in a variety standard heights and widths. Made from Quality Tested and Certified Prepainted Hi-Tensile ColorSealed® coated steel. GramLat® 3D Lattice™ can be installed on exisiting GramLine® Steel Privacy Fence using our Channel Post Extension Posts or SmartPost® Extension Posts. Common heights on top of a Steel Privacy Fence are 300mm, 450mm or 600mm. Anything over 300mm high please refer to the GramLine® sales team. GramLat® 3D Lattice™ are made from Quality Tested and Certified Prepainted Hi-Tensile ColorSealed® coated steel. Slats are 40mm wide x 12.5mm thick which are clenched together to fit neatly into our rails. Diagonal spacing between the slats is 45mm, 28% visibility. The cut edges are fully protected from the weather to give this product the same life expectancy as the steel privacy fence you erect it on. Please download our GramLine® Installation Guide. GramLine® allows you to make more of a statement by adding either the Double Fence Caps or the Decorative Aluminium Balls. GramLat® 3D Lattice™ can also be installed on existing GramLine® Steel Privacy Fence using our Post Extensions.